This is the 2nd in a series of postings on the value of critical thinking in nursing ethics. One of the absolutely fundamental skills of critical thinking is argument analysis, or the interpretation of argument structure. And the fundamental elements of argument structure are argument premises and conclusions. Understanding the way an argument is put together — its structure — is a very good step towards understanding its strengths and weaknesses. Knowing, for example, that a given argument has 3 separate premises rather than just 1, is fundamental to looking for its weaknesses: the more premises it has, for example, the more possible points of criticism. But even more fundamental is the fact that we gain a better appreciation of someone’s point if we can get a better perspective on the shape of their argument. 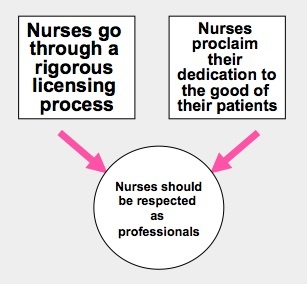 Nurses go through a rigorous licensing process. And nurses proclaim their dedication to putting the good of their patients before their own good. So, nurses should be respected as professionals. The arrows in this diagram represent the author’s intended logical “flow” — they can be read roughly as representing the word “so” or “therefore.” This argument has 2 premises, each of which gives at least some support to the conclusion. (The fact that there are 2 arrows indicates that there are 2 separate chains of logic here; each premise gives some reason to believe the conclusion.) At this stage all we are doing is sketching the shape of the argument; we are not yet engaging in a critique. But from a critical perspective, this means that if you find fault with one of the premises, the conclusion is still supported — at least to some extent — by the other. Nurses around here are unionized. No unionized group can really be a profession. So, nursing (here) isn’t a true profession. This argument also has 2 premises. But notice that (as implied by the line joining them, and the single arrow flowing from that line to the argument’s conclusion) these 2 premises are working together. They need each other in order to lend support to the argument’s conclusion. This means that a convincing criticism of either one of those premises robs the argument of all of its force. That’s not to say that the conclusion is false, even if its premises fail; it’s just to say that this argument can’t support the conclusion, if even one of its premises is in doubt. Now, those are very very simple arguments, and the analysis suggested here is not exactly profound. But the simple process of sketching the shape of an argument — your own or someone else’s — is useful in making clear just how much support the argument has, or doesn’t have, and where its weaknesses may be. The diagramming method used here is adapted from Lewis Vaughn and Chris MacDonald, The Power of Critical Thinking, 2nd Canadian Edition, Oxford University Press, 2010.